That’s quite a combo isn’t it? Fortunately, the parking lot portion of the week was separate from the bluegrass festival. After leaving Colorado we had to make a necessary stop for some truck repairs. We choose Rock Springs, WY because it was convenient to the bluegrass festival we planned to attend the following weekend, just off I-80, and they had a Toyota dealership. Having repairs done on the road is always a pain. We’re lucky that Tim is so handy because it means we hardly ever have the Airstream or truck worked on. 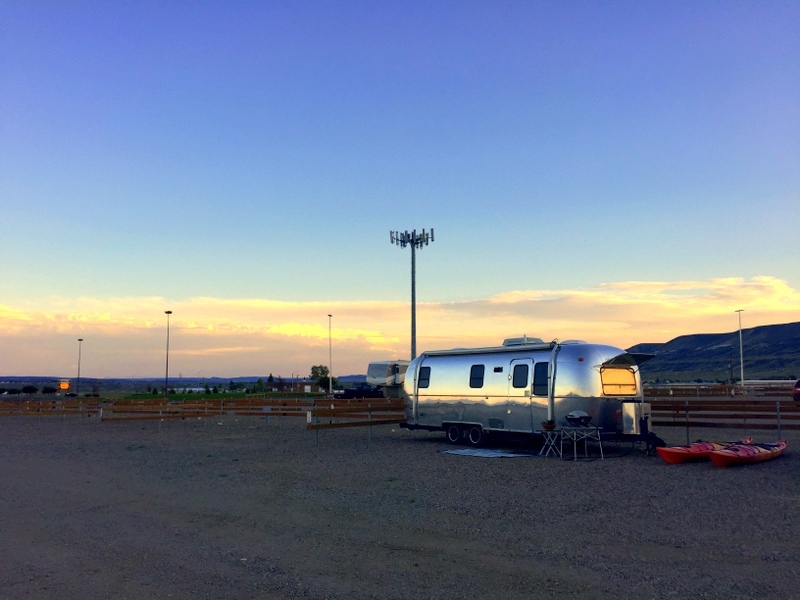 In fact, in five years of full-timing, we have never had anyone else work on the Airstream! The truck has gone in for a few routine maintenance things over the years, and Tim has also done a few things (replaced the brakes, a portion of the muffler, etc.). This time the rear wheel bearing needed to be replaced and it seemed like a job better left to the professionals. Well…I won’t go into all the details, but let’s just say that the guys who work at the Toyota dealership in Rock Springs, might not be quite at the professional level. Finding a repair shop is such a crap shoot and this time we got the short end of the stick. In the end, we left Rock Springs nearly $1000 lighter and with the same humming noise coming from the tire as when we arrived. Sigh. Because we were without a truck for a few days we didn’t explore the area at all. 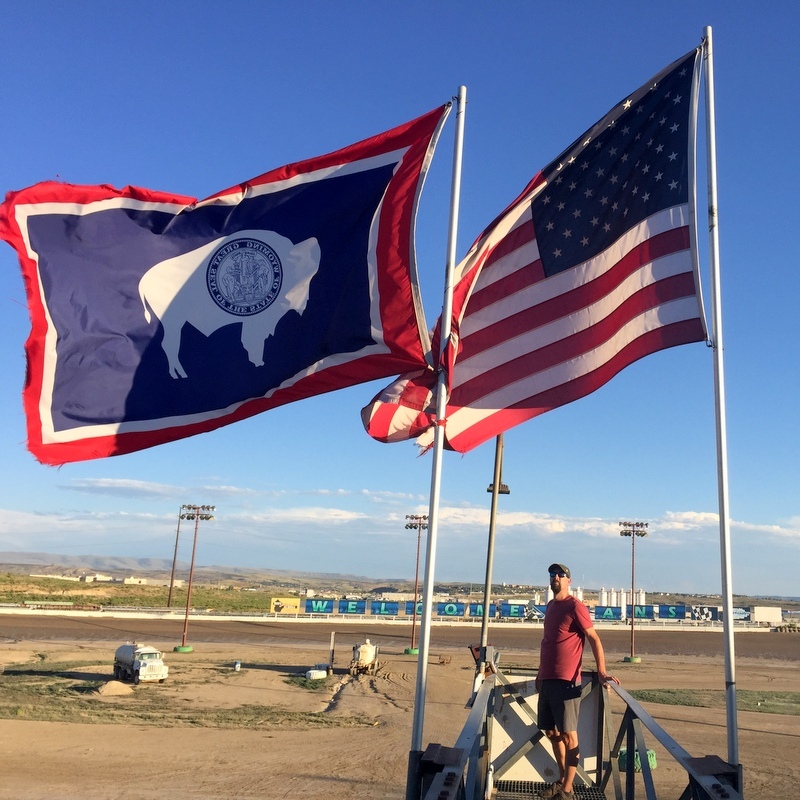 Instead, we hung out in the parking lot style campground at the Sweetwater Events Complex with the AC blasting – it was hot that week! It might not have been the most scenic campground, but it was clean, relatively quiet, mostly empty, and not a bad value at $25/night for full hookups. The onsite caretaker couldn’t have been more accommodating. She told us we were welcome to park sideways and take up more than one site in order to reach the hook-ups. Good thing, because there’s no way we could have used the sewer if we had pulled in straight. Needless to say, after a pretty low-key week we were excited to head out on Saturday morning. 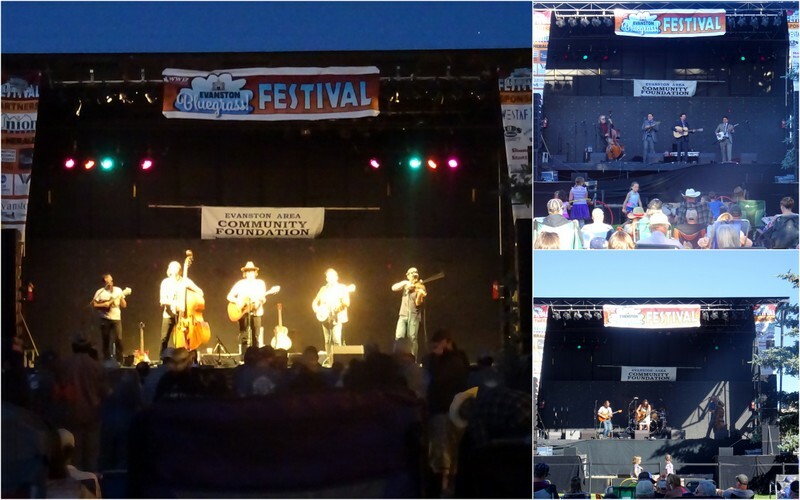 Our destination was the small town of Evanston where they hold a yearly day-long Bluegrass Festival. Only a few of the bands were familiar to us, but we figured you really couldn’t go wrong with a day spent lounging on the grass while listening to music. 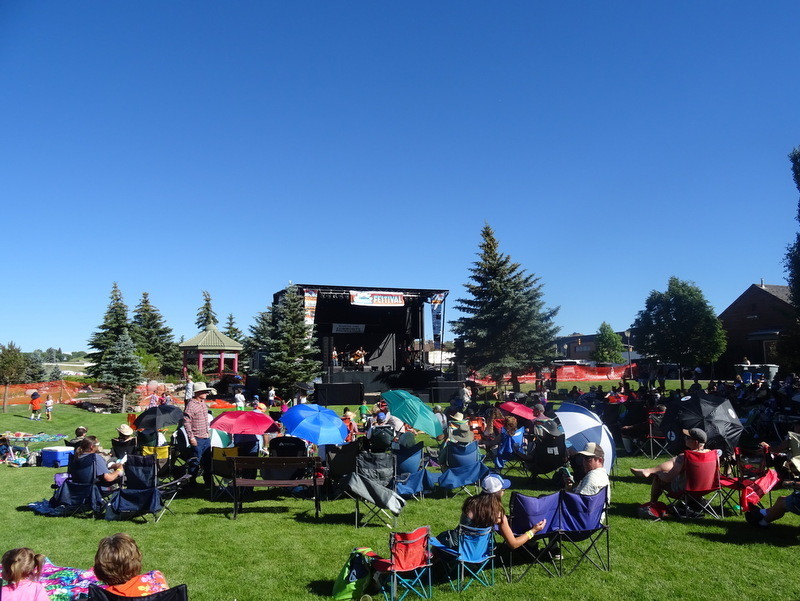 The festival ran from noon to 11 pm and featured eight bands. We got there around noon, found some street parking for the Airstream (we love small towns), had lunch and lounged around, and then headed over to claim a spot on the lawn. 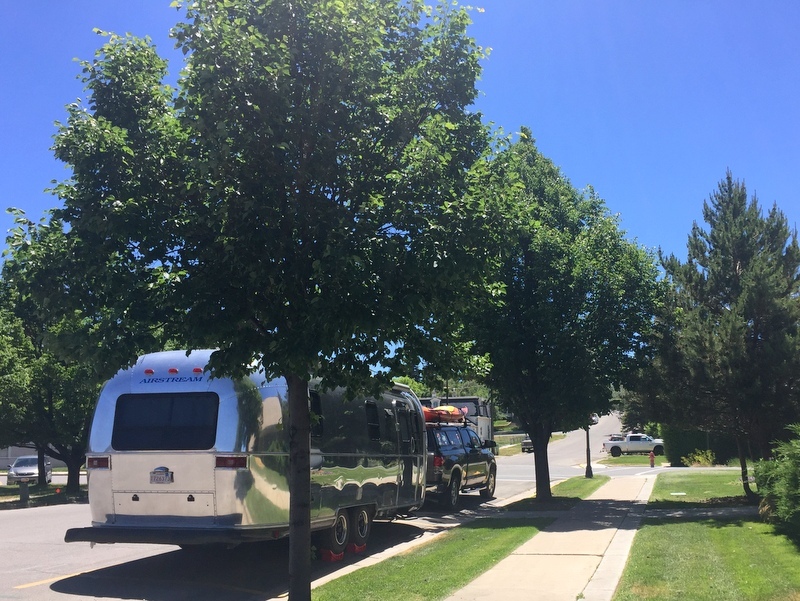 Street side RV parking – we even got a tree for shade! It was the perfect size festival. I would estimate there were a few hundred people who filtered in and out throughout the day. 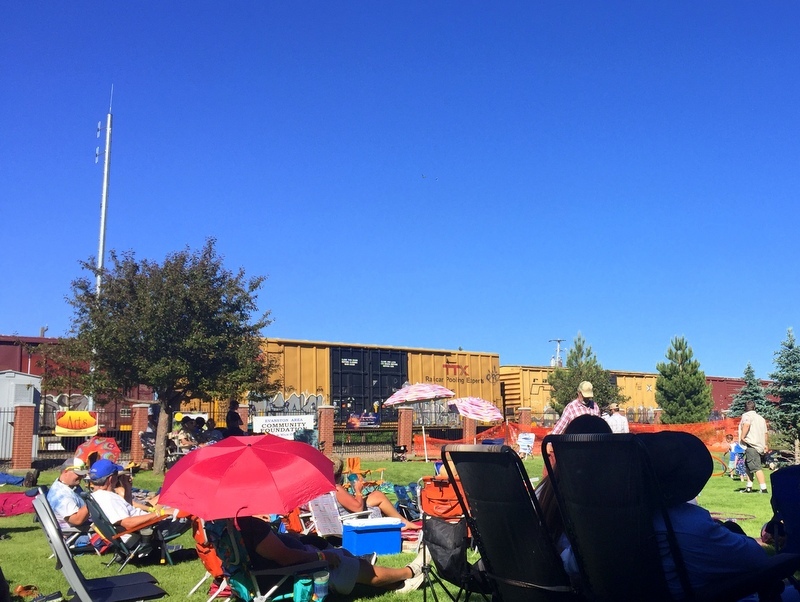 There were families and people of all ages hanging out enjoying the sunshine and music. They had activities for the kids and vendors selling yummy foods and crafts. (We had the most delicious Romanian pastry called a Chimney Cake. Sooo good!) We ended up setting up in the shade of a large tree with our chairs and picnic blanket. Like everyone else around us, we left our stuff set up while we wandered around visiting vendors. At one point in the afternoon we went back to the Airstream for a couple of hours and when we came back our set up was just how we left it. There was a train next to the park that went by every 30 minutes. It really emphasized the fact that this is western frontier town! Highlights of the day included the Dodgy Mountain Men, the Two Tracks, and The Brothers Commotose who ended the night with a fantastic set. We had planned to move over to the Walmart for the night, but after seeing a few other RVs still parked on the street at the end of the festival, we decided to stay right where we were. No one bothered us, and we left bright and early the next morning to head north into Idaho. When getting the vehicles worked on it’s so nice to find a safe and quiet spot to set up for a few days. You’re so lucky that Tim is such a handy guy!! I really need to find us some more music on the road – that festival looks perfect.